The documentation and representation of an event is never objective but individual and biased. This is most apparent when you have the privilege of both, being a team member and an observer of a key art event like the Kampala Art Biennale. This is exactly the position I have: As a coordinator of the talks, I worked together with the small but highly engaged team on our aim to make the Kampala Art Biennale the best possible event and offer the visitors a professional, informed and attractive exhibition at the six different venues, including the talks and art education program. However, as a social anthropologist specializing in the relationship of art and social space, I am also interested in the less representative aspects of a Biennale, such as the team spirit that comes up when goals and ambitions seem higher than what time and means allow; or the strange behavior of art works and objects in both, the process of their becoming and after their completion; or the inventiveness and flexibility of artists working in a place that is rich in both, unexpected events and informed, helpful, and skilled colleagues. 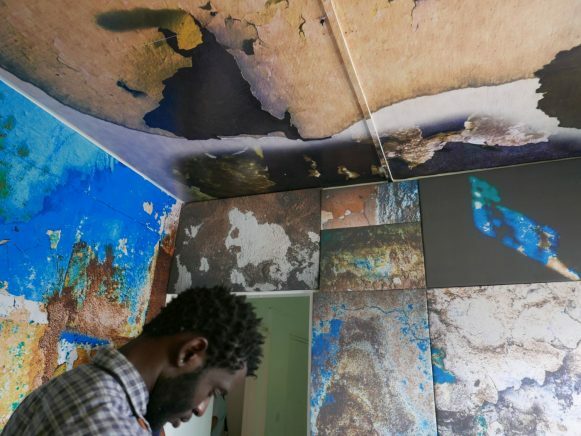 For this photo essay, I try to take advantage of the privileged but also ambiguous position as a Kampala Art Biennale team member and an external observer; between the opportunity to be an ‘insider’ while trying to maintain also the ‘outsider’ perspective. I therefore have tried to create a photo essay that reflects official and representational impressions of the Biennale alongside with unofficial, haphazard, ‘backstage’ situations. These impressions are inevitably selective – and from time to time a bit tongue-in-cheek. 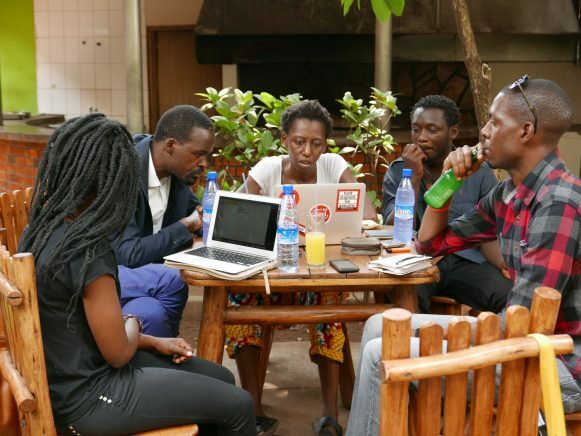 One of the first team meetings after the arrival of Biennale curator Elise Atangana from Paris. With six exhibition venues, three public talks (two of them at Alliance Française) and an education program involving 25 KCCA schools in Kampala, we were all very busy, and I think we never managed to take a picture of the entire crew… Left to right: Martha Kazungu, Daudi Karungi, Elise Atangana, Eric Mukalazi, Adrian Migadde. Missing in the picture: Elizabeth Mbabazi, Lucie Touya, Jantien Zuurbier, Igor Devernay, the volunteers (Ekwang Olwol Peter, Drazu Rita Masendi, Kalende Rebecca, Bagabo Deborah, Wasswa Lawrence, Nansubuga Shakirah, Opondo Leonard, Nakamya Lydiah, Nanteza Moreen, Bogere Gilbert, Kiiza Ezra, Rebecca Nampewo, Iteka Christa Aniella, Patrick Bongelembe, Namiyonga Priscilla Charity), and myself. 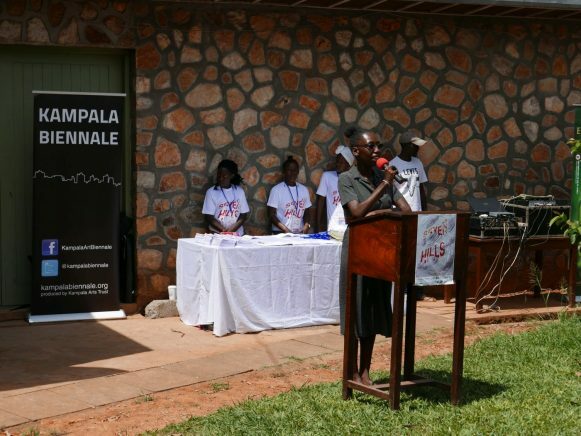 Official opening ceremony of the 2nd Kampala Art Biennale on Friday morning 2nd September 2016 at Uganda Museum. 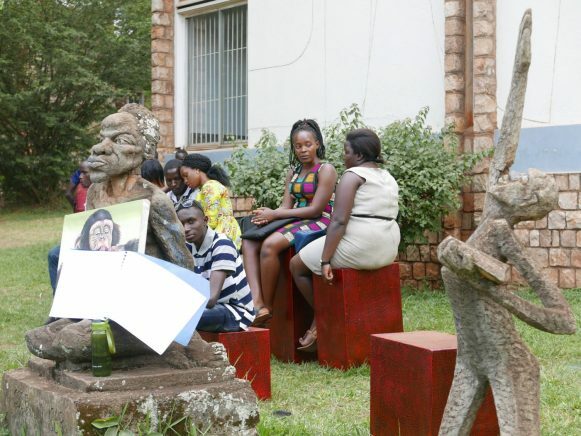 Xenson Znja’s Ndiboota Exporters in the gardens of the Uganda Museum. A wheelbarrow absurdly resting on a dead tree with a barkcloth-wrapped cargo earmarked for export. Where to? How? For what purpose? To whose advantage and to whose disadvantage? Like many of my favorite works at the Biennale, it is a multi-layered work that explores the ambiguities and contradictions of (seemingly) mobile humans and goods, and the opportunities and pitfalls coming with economic, political and social power relations. Alden Paul Mvoutoukoulou’s En-vi-ron-ne-ment connecté at the Uganda Museum. A visually intriguing, beautiful and poetic work at first sight. Zooming in and discovering the medical material he uses for his virtual cities, the viewer is however faced with pervasive questions about what is a healthy, what a sick city? What auxiliaries – for mobility, for social networking, and for a globalized urban life as such – are reasonable? And at which point do we exceed our human limits? A fraction of Elsadig Mohammed’s Visions and Dreams at Afriart Gallery. An extremely powerful installation that involves the entire body of the viewer. A year ago, I had read a text by the artist that describes the vibrant world of textures that inspires his imagination, and as I entered the space, I immediately found myself in the text again. Added by objects like a toilet bowl or an ashtray, the narration continues like a riddle. 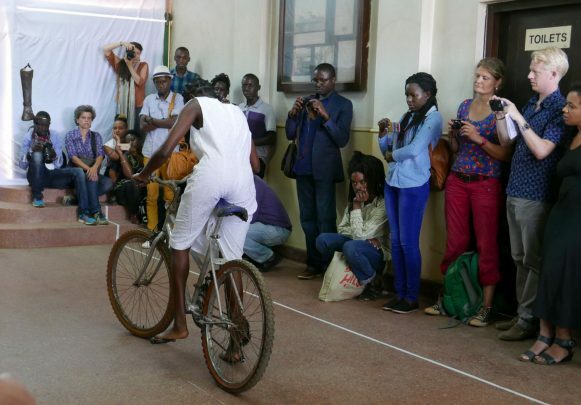 Immy Mali’s performance Safe Here at the opening of the Railway Station attracted a large audience that was captivated by her lengthy struggle to climb and drive a bicycle – a childhood memory of restricted mobility painfully made felt to the visitors. They trudge through the many failed attempts of the artist and are somewhat relieved as the 30 minutes of performance are over. 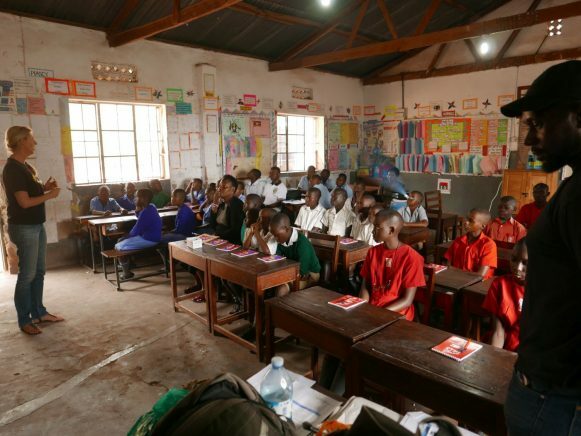 A very different sensation to that of most kids in Kampala who feel that their 30-minute break at school always ends far too soon. 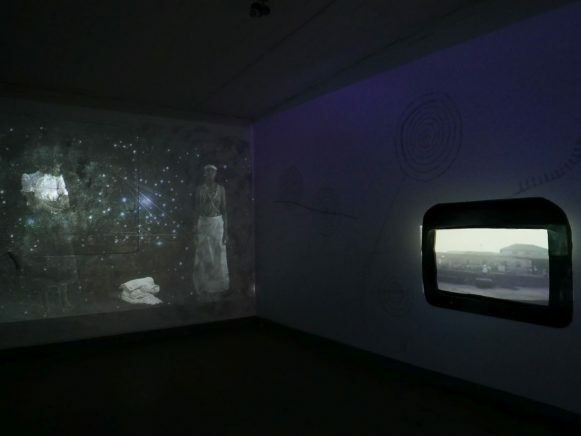 Similarly, Sajan Mani’s 50-hours performance liquidity Ar reflected the state of limbo experienced by people who are marginalized and displaced from where they are, but who also cannot really reach other shores. This exhausting state of longing while never really belonging is reflected by both the location and the duration of the performance. 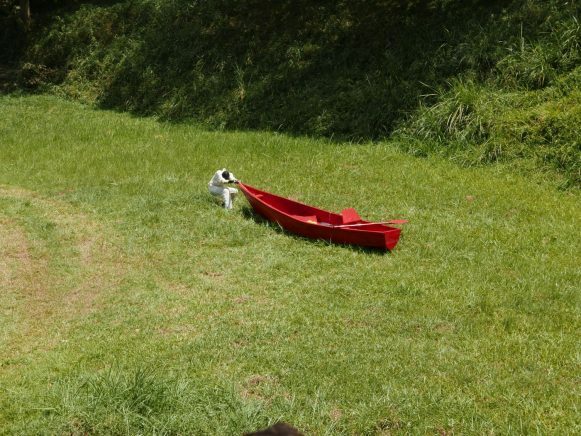 There is something existential about the decision to spend two nights and two days in a red boat in a vast but somewhat ignored grassfield next to the museum. The photograph was taken early in the performance as he tried to mobilize the sluggish boat. This is the most beautifully decorated classroom I’ve ever seen. 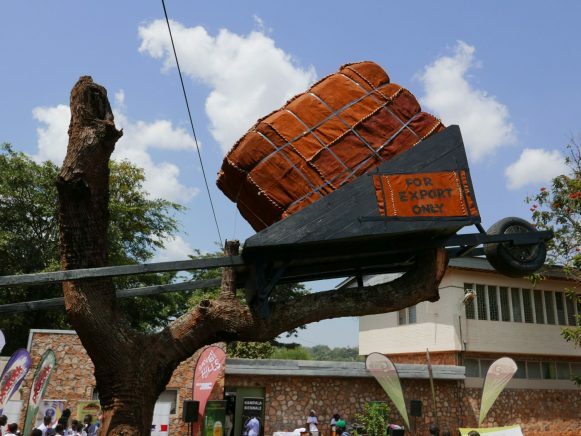 It hosted school kids from five different KCCA schools who participate in the Seven Hills Art Challenge. 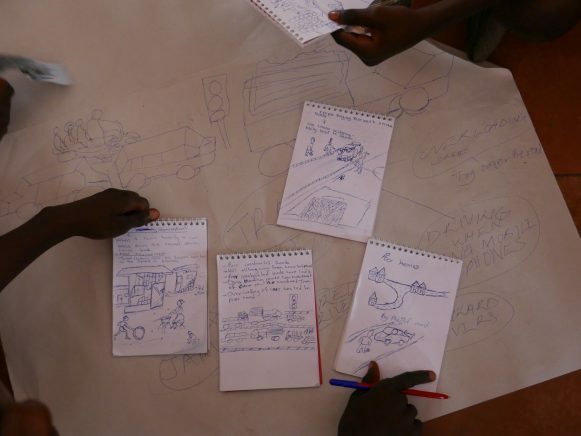 They compete with twenty other schools in developing the most compelling artwork reflecting their daily experiences with Kampala as a city in motion. The winners will be announced on 2 October at Kampala City Festival. Art education team: Jantien Zuurbier, Henry Mzili Mujunga and volunteers. There is a general agreement that art is a product of creativity – no matter if made by professional artists or talented kids eager to learn. Creativity however also was a fundamental part of the Biennale behind the scene. Like in other exhibitions worldwide, some initial plans had to be altered due to unexpected challenges for which new solutions were found. This is one example: Unable to find the TV she needed for her mesmerizing installation I was her and she was me and those we might become at Uganda Museum, Kitso Lynn Lelliott followed a suggestion of the Biennale Director and simply painted it on cardboard in a cloak-and-dagger operation. 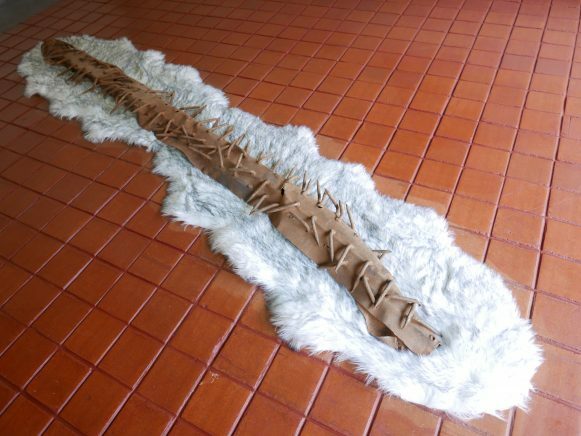 The Barrier Wolf von Kries found for his installation at Makerere Art Gallery after a long search with many virtually surrealist conversations and negotiations will definitely shape the oral history of this Biennale (no space here to narrate these stories…). 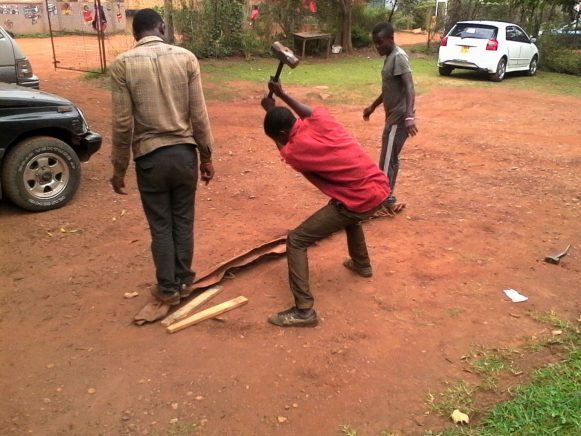 The final installation saw this rough and somewhat violent and violated metal monster bedded softly on a white fur carpet, as if it was prepared for a dignified rest after its wild life on the roads of Kampala. Who would guess that before this rest, it was once more exposed to a hammer massage to be brought into its final shape? 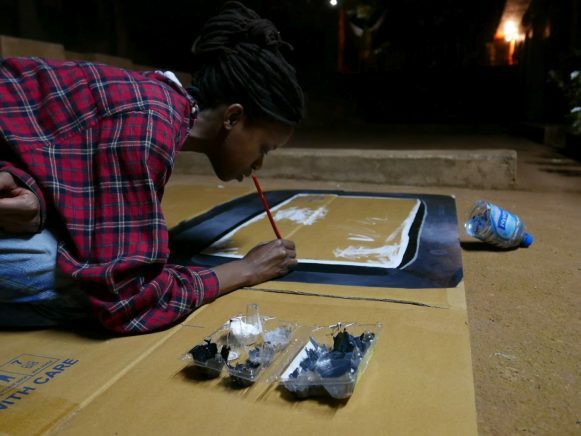 Ronex Ahimbisibwe’s Rx2…wireless outside Makerere Art Gallery was conceived as an interactive artwork from the beginning. 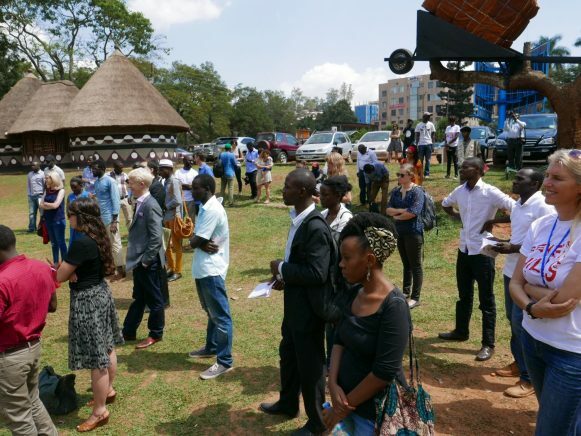 Therefore, it was expected to be used by visitors of the exhibition or students on Makerere University campus. Representing online-symbols typically used for internet and mobile phone connections, these sculptures explicitly refer to exchange and communication while in their function as actual outdoor furniture, they also serve as a platform for online as well as face-to-face interactions. However, as they were shifted and rearranged by their users according to their needs, the sculptures developed their own dynamics. Perhaps more than initially intended, this work embodies for me a fascinating example of the dynamics at play when art transgresses the symbolic sphere and becomes a mobile means of lived social space. Fiona Siegenthaler is a Senior Lecturer and Post-Doc researcher at the Chair for Social Anthropology, University of Basel (Switzerland). During one of her research stays in Kampala she also coordinated the talks and symposiums program for the second Kampala Art Biennale 2016. Nothing from Nommo Gallery!!? Woah! 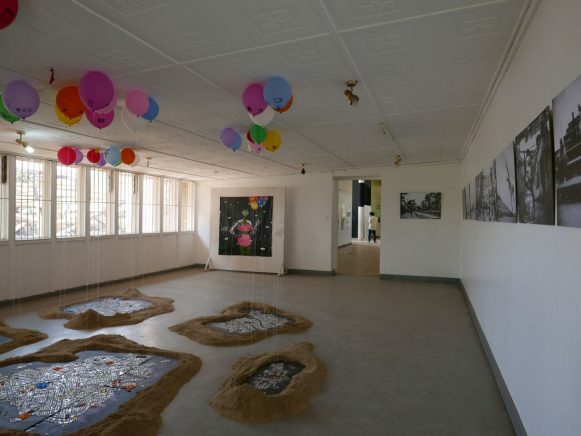 Here are some pictures from among the amazing show, of the Biennale too, at Nommo Gallery.